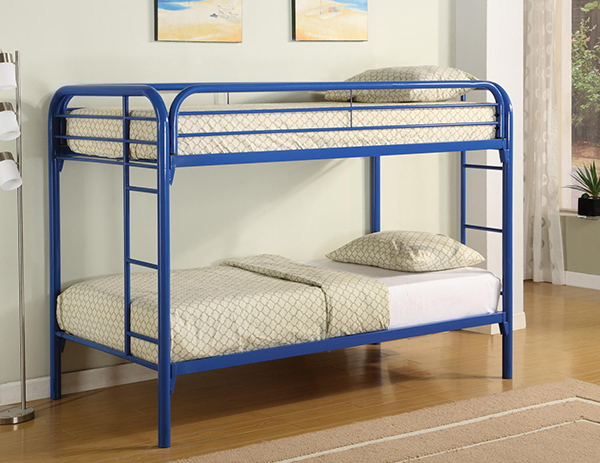 The fun space saving design of this Twin Twin Bunk Bed by Coaster will make a wonderful addition to your child’s bedroom. Built-in ladders on each side offer convenience, while full length guard rails provide security. The strong round 2" metal tubing construction promotes strength, durability and safety. The high gloss finishes are available in black, blue, red, and white, allowing you to create the perfect look for your child’s room.